The Gilligan’s Island rescue movie was a phenomenal success. It still ranks as one of the most highest rated TV movies. Based on that success, another movie was quickly written and filmed. It was envisioned as the pilot for a new TV series featuring the castaways as hosts on an island resort. In the second movie, called The Castaways on Gilligan’s Island, the story picks up just days after the previous film with Gilligan discovering parts of old World War II planes on the island. The Professor is able to create one workable plane and the castaways make an attempt to fly the plane back to the mainland. Gilligan accidentally falls out and parachutes back to the island. The others dutifully go after him, knowing that they are sacrificing their chances at rescue. When the plane lands, an engine falls off the plane and they realize that going after their “little buddy” actually saved their lives. The Coast Guard spotted the plane on their radar and rescues the island residents once again. Flash forward to a year later and we see the island is now home to an expansive resort called “The Castaways.” The resort was built by the Howells and all of the friends are partial owners and help to run it. The movie then becomes a bit like “Fantasy Island meets The Love Boat” as the story focuses on the guests and their problems with our castaways helping them out along the way. Guests to the island included Happy Days’ Tom Bosley and The Bob Newhart Show’s Marcia Wallace. For a variety of reasons, this pilot did not fare well in the ratings and all plans for a new series were stopped. End of story, right? Nope, not quite. In 1980, the head of NBC programming, Brandon Tartikoff asked Sherwood to put together a new movie with the very popular Dallas Cowboy Cheerleaders visiting the island. Because of a variety of circumstances, the lovely lady cheerleaders had to be replaced by the all-male Harlem Globetrotters, which changed the story significantly. The movie centered around the castaways, the Globetrotters and a couple of evil scientists, played by Mission Impossible veterans Barbara Bain and Martin Landau. The plot wasn’t any better than how it sounds. Thurston Howell III’s character played a prominent role in the script but Jim Backus became ill shortly before production started so the Howells’ full grown (and previously unseen and unknown) son, Thurston Howell IV, was introduced. Jim was well enough to make a small appearance in the film. As you might expect, the ratings for this film were dismal at best and no further movies were produced. 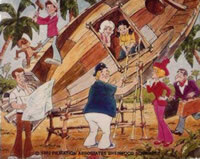 Filmation, who had produced the New Adventures animated series created another entitled Gilligan’s Planet. Picking up where the first series left off, the Professor is able to make a crude spaceship which the castaways hope to fly to civilization. Unfortunately, they end up going into deep space and land on a remote planet. They’re marooned again, only this time it’s far away from Earth. Only Tina Louise was absent from the original cast in this animated incarnation, with Dawn Wells providing the voices for both Mary Ann and Ginger. And that was the end. Well, not quite. There are few other shows that have the staying power and popularity of Gilligan’s Island and the castaways. Stay tuned. Gilligan’s Island: Why Weren’t Mary Ann and the Professor in the Opening Theme Song? Gilligan’s Island: Part 3, Finally Rescued?